I picked up this orange/red variegated sweater knit more than a year ago, with the intent to make a cardigan that could be work with a ton of different colored tops, but never got around to actually making the cardigan. Possibly because this fabric screams Autumn to me, and by the time Autumn does roll around, I want something warmer than a light knit cardigan even though I live in California, where the seasons barely change. As I was thinking about my corduroy jeans, this fabric popped into my head and I knew I had to make something with it this season. I fell in love with this split cowl sweater pattern as soon as I saw the pictures when the McCall autumn patterns first came out. I put it on my list and picked it up the next time patterns were on sale at JoAnn. Initially, I wasn’t sure how the pattern and fabric would pair, but I figured if I didn’t like the cowl collar, I could always just make a band and hem it as a t-shirt. I don’t know if it was the pattern or the fabric, but I had to remove a lot of fabric from the pieces. I think I ended up taking about an inch off of each side seam. Once I had the top fitting, I basted the collar on, and absolutely loved it. The angled/split cowl with the buttons gives the top just enough of a pop to make it more than just a t-shirt without being too edgy/extreme. While I love the look of this fabric, it is certainly not the easiest knit to work with. Even my serger didn’t like it. After some googling, I found Wooly Nylon thread (also called textured nylon, stretch nylon or bulky nylon, depending on the brand of thread). I ordered some online, and it was in my machine 4 days later. I set up the machine with the nylon thread in both loopers as well as both needles, using bobbins filled with the wooly nylon thread for two of the spools. I forgot to take before and after pictures, but the difference was pretty amazing. The fabric fed through the serger a lot easier, and looked much happier once I was done. Since the construction/serging had gone so well, I decided not to mess with success and try hemming the top with the serger rather than setting up the coverhem machine. Of course, when I tried to do a rolled hem, the machine tried to eat the fabric. So, instead I did a 3-thread serged edge and got a much cleaner finish. The cowl seems to shift a lot, especially in the back (and therefore bunches and doesn’t lay flat). I’m considering tacking the cowl to the shirt body in a few places to try to prevent bunching, but haven’t done it yet. Overall, I really like this pattern. Though it is fairly distinctive, I do plan to make one or two more, as I have a feeling it will look significantly different in different colors/textures. I finally got pictures of my 6PAC. I’d been using my brother’s tripod, but he loaned it to a friend…so I enlisted him as a photographer instead. Which, of course, means that I was a bit rushed and didn’t style/accessorize at all. I ended up with a nearly entirely different 6pac than I set out to create. I really wanted a white drapey cardigan, but tried 3 patterns that did nothing for me. Then, I decided that I really would never wear a navy jacket, so I nixed that one. Also ended up with three different tops than were in my original plan. But…I really like what I ended up with and have been wearing every piece a lot. Simplicity 1919 runs a bit big. The first one I made was a size 12 in a knit fabric. When making knit tops, I usually use size 10. In a woven like the green jacket above, I went up to a 14, which fits great. I love the subtle peplum and princess seams in this pattern. 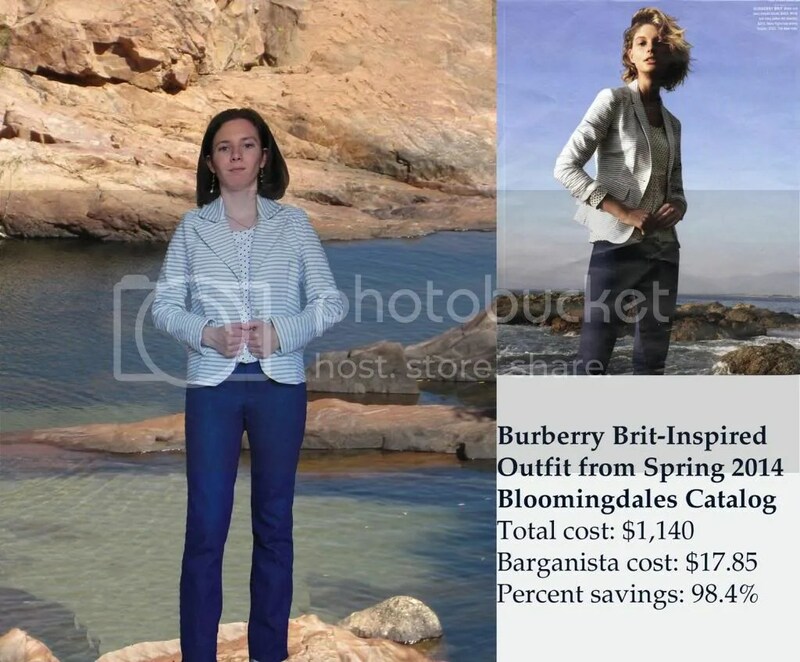 I would love to make this jacket again, but wonder if it is too unique – and if the peplum detail will make it go out of style faster. Regardless, I am very happy with this jacket. This is the third time that I’ve made Simplicity 2364. You can see my first attempt here, from several months ago. Between the two versions, I went down from a 12 to a 10, and the pattern fits much better. I really like the combination of the shrug and draped neckline. This pattern comes together very easily – and I love that the neckline is finished during the sewing process – so there is no extra hemming to be done at the end. I initially bought Simplicity 1613 for the twisted neckline t-shirt, which was included in my original 6pac plan. However, once I made up the shirt, I didn’t like the busy neckline. I think there was just too much going on in too small an area on me. Since I had the pattern, I decided to try the other view included. I didn’t make a muslin – just cut into my ‘real’ fabric and hoped it worked – and it did. I used a striped stretch lace, intending to wear this top over a tank top. I don’t know that this is really my style, and it will likely get the least amount of wear of anything in this 6pac. But, the pattern was very easy to sew, and if I do find myself wearing the shirt a lot, would not hesitate to make it again in another color. Hot Patterns Fringe Festival Scarf Top is a free pattern that can be found on Fabric.com. I’ve made this top several times, and love all of them. In this version (and most that I’ve made), I eliminated both the center front and center back seams, left off the scarf detail, and shortened the top by several inches. I really like the fit of this pattern, and it has become my go-to cut-on sleeve pattern. 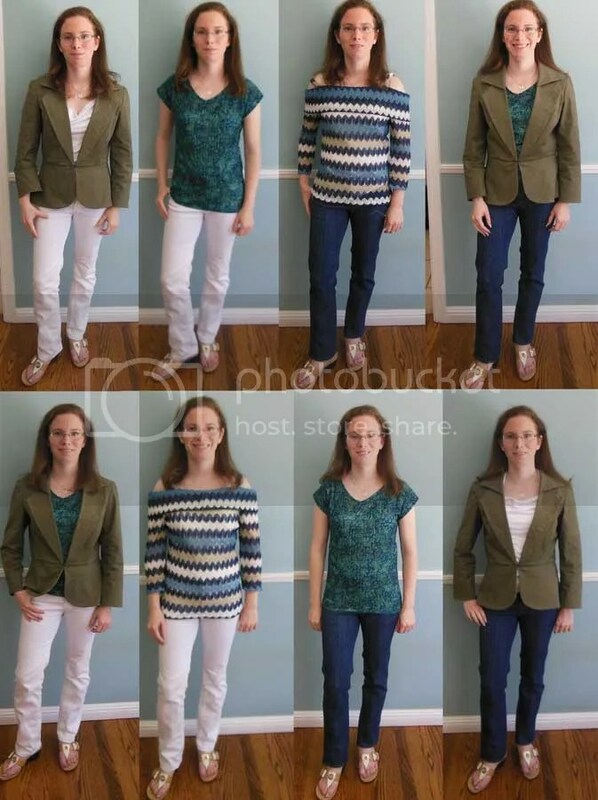 The Jeans – I love having a tnt jeans pattern. It’s great fun to make a pattern that I know will fit right, where I can focus on the details and creative design rather than on fit. Note to self when making white jeans in the future: use a thin, white fabric for the pocket bags and test before sewing to make sure they don’t show through too much. After sewing much of the white jeans together, I realized that the pocket bags showed through majorly. I ended up cutting off the pocket bags at the end of the facing. About all that will fit in the pockets now is some change or a stick of gum, but I don’t use my pockets much anyway. I’ve been using my current purse for almost a year and a half. I made it before I got my serger. Before I really cared about things like interfacing and reinforcing my fabric. Before I cared about using quality thread. In other words, before I really believed that I could make things that were worthwhile and good enough to really be used. In spite of all of that, it quickly became my favorite purse. 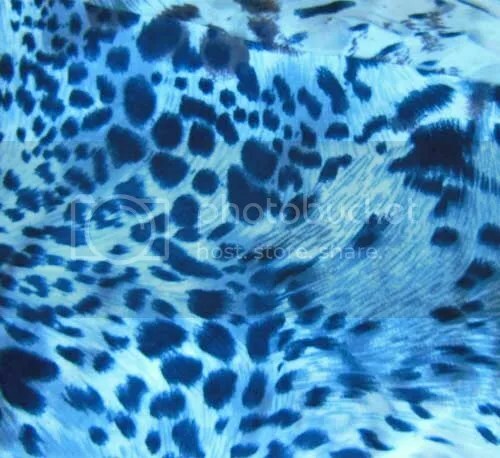 I used it year-round, even though it was a heavy blue/beige woven, wintery-looking home decor fabric, and got compliments on it all the time. I loved everything about it. However, it has finally lost its shape and begun falling apart. As I’ve been interviewing, I started thinking that maybe it wasn’t quite the most professional looking bag I could be using. Since I love everything about this bag, there wasn’t a doubt in my mind that I would use the same pattern. What is this pattern, you may ask? The Evelyn Handbag by Chris W Designs. Evelyn is really the perfect size bag for me. It is small enough that it doesn’t take over my petite (4′ 10″) body, but large enough to hold all of the stuff that I haul around on a daily basis, including my HP netbook. At one point, I crammed my netbook, Kindle, portable GPS, wallet, phone, and a reusable shopping bag into this little bag, and it all fit more-or-less comfortably, without straining any seams. I knew I wanted a neutral color and fabric for this bag, one that would look good with almost any outfit. I found this cool faux suede at JoAnn several months ago that I bought with the intention of making a case for my new (then) Kindle Paperwhite. I haven’t yet managed to create or find a Kindle case pattern that does exactly what I wanted, so the fabric sat in my closet. I have a huge stash of home decor fabrics that would make a great Evelyn bag, but none spoke to me quite the way this suede did. It’s a kind of brown, kind of black blend of colors that changes depending on the way the light hits it (which you can easily see in the following pictures, all taken at the same time, in the same spot, with the same lighting and same camera settings). 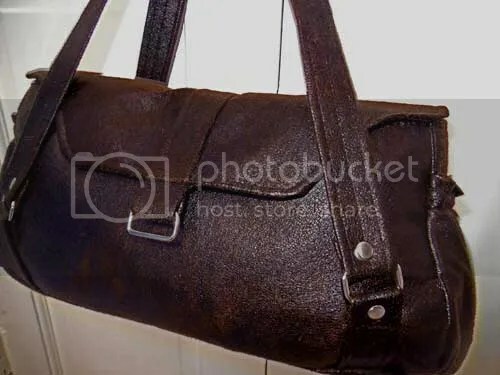 Although I tweaked the pattern a little, changing the types and amount of interfacing, width of the strap, interior pockets, the finished purse looks almost exactly like the designer’s pictures of the bag. I did miss a step (step 7d, sewing the straps to the body of the bag), but it didn’t render the bag unusable. I love all of the pockets in this bag. 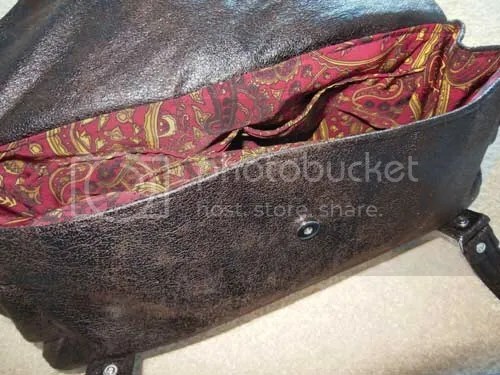 Between the three large patch pockets on the lining, the two elastic pockets on the sides, and the zippered pocket on the back, there is plenty of room to keep all of my stuff organized. I love my new bag. It is everything that I hoped for when I started, nice/neutral enough that I can take it on an interview, yet casual enough that I can carry it when I go on errands. I am looking forward to making yet another Evelyn bag in fun spring/summer colors. I picked up a stack of Simplicity patterns last time they were on sale at JoAnn. (If you haven’t figured it out by now, I’m a complete sucker for sales). I had been looking for a long sleeve shirt that was warm, had full-length sleeves, and was cuter than an ordinary round- or v-neck shirt. Simplicity 2364 almost fit that bill, and would be easy enough to adapt as the only thing it was missing was the long sleeves. 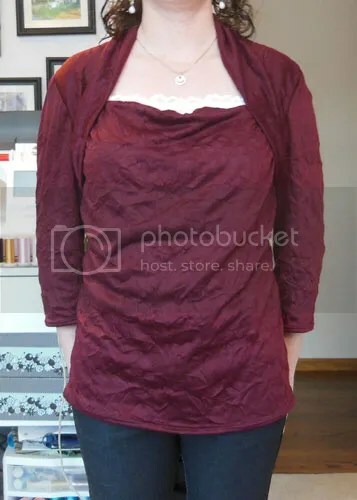 I decided to sew it in a maroon crinkle knit that I picked up several months ago from Fabric.com. After looking at the pattern on patternreview.com, I wasn’t sure if I would like the neckline that looked to me like a cross between a square and a cowl, depending on the fit of the top on each individual person. Even after sewing my maroon version, which was for all effects, my wearable muslin, I can’t decide if I like the way the neckline hit me. If I let it drape naturally, the neckline falls a bit too low for my taste, and I don’t love the look if I tug the neckline straighter across. I’m playing with the idea of tacking the shrug and front drape where they meet at the front (higher than where they naturally fall) and ruching the front center for a few inches, then repeating the effect on the lower several inches of the side seams. Overall, I really liked the way this pattern came together. I cut and sewed a straight size 8, which fit me very well without further alterations, other than the previously mentioned neckline issues. The faux shrug was easy to work with, and combined with the self-facing effect on the front meant that there was no hemming/finishing work needed on the neckline. If I were to sew it again, I would probably raise the neckline an inch or two to try to get the front drape to fall a bit higher. I’ve recently come to the conclusion that I am outgrowing my current wardrobe. Not in size, but in personality and functionality. I’ve lived in jeans, t-shirts, and fleece jackets for the last several years. I have no problem with the jeans, I think they are among the most versatile pants. But I have no need for another boxy fleece jacket that doesn’t really even fit very well. So, what does this mean to you, you may ask? Well, in a nutshell it means that you’ll be seeing lots of clothes in the coming weeks. My to-sew list includes two dresses, a skirt, two tops, a jacket, and a pair of jeans (not necessarily in that order). I’ve been going back and forth for several weeks about which project to start. Simplicity 2646 finally won that debate, simply because I need a dress to wear to a wedding in two weeks. 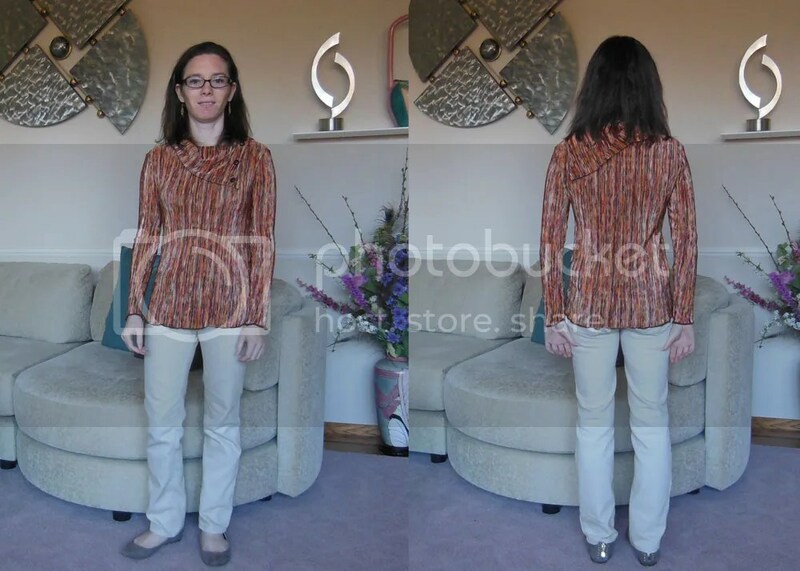 I’m making view c, but without the waist buckle so that I can wear it with or without a belt, depending on the outfit in a stretch jersey ITY knit from fabric.com. My goal is to get the fabric cut today, and to have the dress sewn by Saturday.